The fifth and final installment of the Mr Tinfish series will definitely remind you of why you love the series in the first place. The tremendous amount of noise caused by the recent arrival of hundreds of seabirds has Mr. Choli up in arms. He’s determined to bring this issue before Mr. Vinegar and get a stop put to this immediately. Mr. Ginger, on the other hand, is more concerned with the problem of disappearing fish. While this is the reason all the birds have come to rest near the river at Daphne Wood, the other problem is that he certainly can’t cook all his delightful and interesting meals without a fish supply. Mr. Vinegar is more concerned about what the birds’ roosting is doing to his roof. Something must be done! As everyone in Daphne Wood rises to another challenge, Mr. Ginger gets to try a new adventure, William Tinfish comes up with a new idea, and Mr. Vinegar is shocked over new developments. 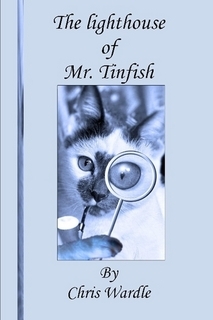 They say all good things must come to an end, but I am certainly sad to know that I won’t have any more books in the Mr. Tinfish series to read. In this engaging final installment, the hundreds of seabirds looking for food have come to the river of Daphne Wood. Not only are they loud, there certainly isn’t going to be enough fish for everyone if they stick around. But the larger problem is that the fish don’t seem to like the change in the ocean currents. The warmer waters, which Daphne the polar bear isn’t fond of, aren’t liked by the fish either. So, the fish moved to a new location, causing a shortage of a very necessary food supply for many of the residents of Daphne Wood. In Mr. Ginger and the Disappearing Fish, readers find much of what they have enjoyed in the earlier books in the series: the kooky characters whose quirks make for many funny moments; the cooperation amongst all the members of Daphne Wood to meet the challenges climate changes bring upon them; and the numerous expeditions that include some interesting communications between the expedition teams and Mr. Vinegar. I found the addition of the seabirds in this book to make for some great conversations and situations. Wardle knows exactly what he needs to do to move this story along . There is never a moment when the reader isn’t eager to turn the pages. Despite the fact that this book is dealing with a very serious issue, Wardle continues to find a way to get young people thinking, while providing them with an enjoyable read. If I remember correctly, Wardle is also the one who draws the illustrations for Mr. Ginger and the Disappearing Fish, and the other books in the Mr. Tinfish series. I would love to have some of these drawings framed on the wall of my office. I could also see a nursery decorated with the animals of Daphne Wood. While Mr. Ginger and the Disappearing Fish brings the story of Daphne Wood’s zany residents to an end, I like how Wardle left them. I could see some Daphne Wood short stories coming out of this. Perhaps if I beg, the author will give us another book to enjoy. 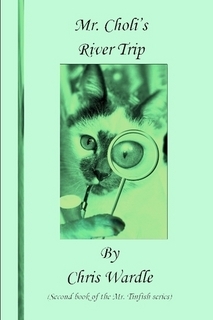 The residents of Daphne Wood return in this fourth installment of the Mr. Tinfish series, Mrs. Cat-biscuit’s search for the downward land. The birds and animals have overcome many obstacles as a result of the climate changes. Having moved from their original homes and settling in Daphne Wood, they have created a community that has met the challenges they face. When an earthquake rocks Daphne Wood, it brings with it greater challenges than they have ever faced before. Can they continue to pull together to adapt to their ever-changing environment? In Mrs. Cat-biscuit’s search for the downward land by Chris Wardle, old and new characters come alive–quirks and all–through a new story of how climate change impacts the environment. The birds and animals have faced many challenges so far: a threat to their homes; establishing a new community; growing crops that can survive the increasingly hot conditions; and how to keep up a respectable fish supply while the ice shelf shifts and thickens. In this new installment, changes brought on by an earthquake send some residents of Daphne Wood off on two separate expeditions. Readers who have explored the first three books of the Mr. Tinfish series, will fondly remember Mr. Choli, Mr. Ginger, Mr. Vinegar, Daphne, the Tinfish family, and many others. New characters are met along the way, and it is going to take everyone to overcome this latest challenge. Having five cats, I’ve always loved Mr. Choli and Mr. Ginger: their love of food, their love of naps, and their hatred of water. While assigning human characteristics to these characters, Wardle also manages to get them to act very much like the birds and animals they are. What Wardle has done well in this book is continue the spirit of cooperation and problem-solving that began with the first book in the series. In addition, his passion in creating these quirky characters is evident. Between his possible sightings of pirates and sea monsters, I’m surprised Mr. Taverre the parrot hasn’t fainted dead away. Finding books that educate and entertain can be difficult. Wardle has managed to create four books that do just that. 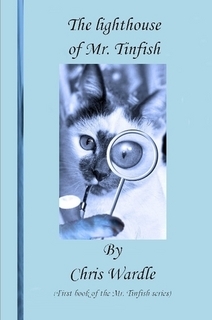 Mrs. Cat-biscuit’s search for the downward land, like the other books in the Mr. Tinfish series, helps young people realize the impact climate changes have on our environment while making them laugh from time to time. Come back tomorrow for my review of Mr. Ginger and the Disappearing Fish. Mr. Tinfish, the penguin, and the other animals of the colony are alarmed when the sudden climate changes cause a rapid rise in the sea level that threatens all their homes. Luckily, Mr. Vinegar, the walrus in charge of the colony, enlists the help of the cats Mr. Choli and Mr. Ginger to find a new location for the colony. In the first of this humorous and engaging series of quirky characters, young readers will discover: Mr. Tinfish, the penquin who lives in the barrel-lighthouse with his family; Mr. Vinegar, the walrus who owns the hardware store and the self-appointed leader of the colony; the cats Mr. Choli and Mr. Ginger who spend their time investigating mysteries as the resident detectives of the colony, when they aren’t snacking on mackrel sandwiches; Mr. Taverre, the parrot who is constantly on the lookout for pirates; Mrs. Chutney, the walaby, who states the obvious and then explains it, and many other interesting characters who make up the colony. The expedition to find a new location for the colony, the adventure of moving the entire colony to Daphne Wood, the mystery of the disappearing river, and rescuing the animals from Volcano Island, all combine together to make The Lighthouse of Mr. Tinfish an engaging and quick read. Wardle has an eloquent style that might be lost on some younger readers, but anyone ages 9 through 12 will enjoy the flow of his prose. 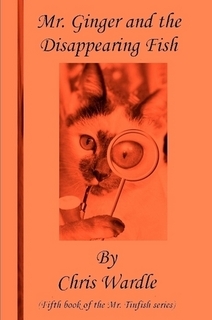 The only hitch I found was that the author continued to repeat descriptive phrases of the animals throughout the book, referring to Mrs. Chutney on many occasions as the one who states the obvious and then explains it, and others in the same manner. I felt once the reader is engaged in the book, he will remember the quirks of each character and these descriptors did not need repeating. The charming and funny illustrations are black and white inside the book, but many are featured in color on the back cover and on the author’s website. I can only assume these illustrations are the handiwork of the author, since there is no credit given to an illustrator within the first few pages of the book. The Lighthouse of Mr. Tinfish is an enjoyable first book of what I feel will be an amazing series. While dealing with a serious issue, the reader is pulled in by the quirky characters and their adventures, and will look forward to reading more books by Chris Wardle.